The ARRL Board of Directors, the League's policymakers, adopted five legislative objectives for the US Congress, at its Annual Meeting last month. Some are of special interest to the ARES community. The first objective is to seek early congressional passage of the Amateur Radio Parity Act of 2017, H.R. 555 and of any Senate companion bill that might be introduced. H.R. 555 cleared the House on January 23. The implications for emergency and disaster response operators, especially in neighborhood and community-based organizations such as CERT and ARES, are profound in terms of being able to enhance their programs and better serving their constituencies. Also, the League will seek recognition of the unique resources, capabilities, and expertise of the Amateur Radio Service in any legislation addressing communication issues related to emergencies, disasters, or national security. More on ARRL legislative objectives here. Recently ARRL Field Services staff have made a concerted effort to improve reporting within the ARES program. The main objective was to use information, submitted from ARRL Section Emergency Coordinators (which is derived from monthly reports by Emergency Coordinators and District Emergency Coordinators) to generate a basic report showing the value that ARES provides to our communities, states and the nation through collaboration with partners at all levels. In early 2016, the first basic report on the status of ARES was released (see ARES in 2015, in the January, 2016, ARES E-Letter). The 2016 ARES Annual Report is now available. The report features basic data drawn from SEC reports, a breakdown of ARES figures by state and FEMA region, and a special challenge for 2017. In addition to the annual ARES report, ARRL Field Services staff will also be producing their own monthly report, to be published in the ARES E-Letter, showing monthly data for ARES, as well as information about ARRL HQ emergency preparedness and field service staff activities. Sharing information about what ARES provides at all levels is critical to our work overall, as hard numbers provide better detail about our work. We all need to pitch-in to ensure that our contributions are counted, and here at HQ we will be sure to do our part. The annual report and monthly reports may be found online. The Orlando Hamcation was packed this past weekend, reflecting the overall growth and health of the amateur service community in the country. The weather was perfect for the mammoth outdoor flea market, and the big tents were crowded with exhibitors and enthusiastic hams toting bulging plastic bags of goodies. There were many luminaries in attendance: ARRL CEO Tom Gallagher, NY2RF, and QCWA President Ken Oelke, VE6AFO, other notables such as Bob Heil, K9EID, Carole Perry, WB2MGP, and Gordon West, WB6NOA, and ARRL legends including longtime Southeastern Division Director Frank Butler, W4RH, who at 92, drove all the way from the western end of the Florida panhandle to enjoy the show. discussing ARRL HQ plans and goals. Szabo introduced other League officials including Southeastern Division Vice Director Joe Tiritilli, N4ZUW; Southern Florida Section Manager Jeff Beals, WA4AW; West Central Florida Section Manager Darrell Davis, KT4WX; and Alabama Section Manager Jvann Martin, W4JVM. Many ARES members, SECs, DECs and ECs were also present and introduced, preceding the lively discourse. declining attendance at club meetings and membership until they eliminated the business portions of the meetings in favor of more hands-on, show and tell demonstrations of equipment, modes and antennas, which turned into big hits. Membership and attendance soared from a modest 33 members to over one hundred. That seemed to me a magic bullet that could spur memberships and meetings attendance for all clubs and ARES groups. I recently sat down for coffee with Karl Martin, KG4HBN, Volusia county, Florida, ARES Emergency Coordinator to follow-up on issues identified in the after-action report he filed on his ARES group's response to the massive Hurricane Matthew hit on the county last Fall. Martin did an excellent job of identifying lessons learned and action items to work on for future incident responses. A few issues were of universal interest to ARES groups across the country and struck me as especially salient: First, he indicated "there needs to be more advance consultation, cooperation and coordination with other volunteer organizations such as area Amateur Radio clubs, CERT organizations, and active church groups for parsing of the limited number of volunteer operators. Martin noted that many ARES volunteers are also members of these other groups who ended up working for them instead of ARES with the consequence that demand for operators outstripped supply for ARES. Secondly, badging/identification must be provided to volunteer communicators for access to sensitive locations such as shelters, and recognition by officials there. Some ARES operators had difficulty getting access to some shelters and in one case, volunteers were asked to leave. Thirdly, there were no coax nor antennas found or marked at some facilities. Having antennas and coax runs pre-placed, working and marked would have made getting communication systems up and running more quickly and reliably. In our chat, Martin said he had already followed up on the first issue by editing the Volusia ARES (VARES) registration page to include fields to identify the registrant's availability for ARES deployment as follows: "Will VARES be the only group you will volunteer for during an emergency? Do you have any other obligations? (This includes work obligations). Can you deploy? Example: Shelters or field location." the county) without official badges. This problem carries over into the next issue discussed, that is, the absence of, or presence of unmarked or non-working coax and antennas in shelters.The county's schools serve as shelters during disaster situations, and are turned over to the Red Cross for management during such times. Normally, the schools are under the jurisdiction of the county school board. It has been difficult to gain access to the schools during times of peace, as budget limitations result in no school staff available to supervise the ARES operators after school hours for antenna and coax work. And like the Red Cross sometimes, it's difficult to gain access to facilities and officials without official credentials from the Sheriff's office. More work will need to be done to resolve these issues. And lastly, ambient and RF noise in the EOC made for a challenging communications environment at times. I chatted briefly with Martin about these issues. A reader of Martin's after action report wrote a letter on these issues, which was published in last month's ARES E-Letter. The ARRL New Hampshire Section has long been one of the most active in the country, and has served as a model for public service communication protocols and development. The section's annual NH-ARES Academy is no exception, continuing that tradition of excellence; it's been effective in recruiting and training new as well as veteran public event, emergency and disaster communications operators for many years. This year, the training program will be held at the New Hampshire State Fire Academy in the state's capitol of Concord, on April 1. The program is divided into blocks of training subjects critical to the development of ARES operators' skill sets. The program will lead off with a presentation on Net Control functioning and how to work efficiently in a net environment, taught by Assistant Section Traffic Manager John Gotthartd, K1UAF, followed by ARES 101, an introduction to the New Hampshire ARES program for new members, taught by Section Emergency Coordinator Wayne Santos, N1CKM. Next, a new section for this year entitled Signals Intelligence (SIGINT), taught by Dave Colter, WA1ZCN, the section's Assistant EC for Training, introduces the concept and protocols for gathering disaster field intelligence for the state's department of Homeland Security and Emergency Management (HSEM) by monitoring other radio services. Message formatting, seemingly always in a state of flux within the ICS framework, is a function that is at the core of the ARES mission, and will be another topic presented, by ARRL New Hampshire Section Manager and veteran traffic handler Pete Stohrer, K1PJS. Hospital Support is another topic to be presented; New Hampshire's ARES program provides support to all of the state's hospitals. Operating plans and new protocols will be discussed by Merle Weber, KB1RJD, and the Hospital Amateur Radio Program (HARP) team. From the HARP operating manual, "the purpose of the [manual] is to provide guidelines, specific instructions, and reference information necessary to connect, configure, and operate a HARP Amateur Radio station in support of backup emergency communications at New Hampshire hospitals during readiness practice drills and actual emergencies, using analog and digital hardware and software for message exchange." A discussion of Go Kit Basics will be led by Alan Bradford, AE1H, from Southern Grafton County ARES, for new members and those needing to take a fresh look at their go kit. The critical importance of the ARES Mutual Assistance Team (ARESMAT) protocol/concept was brought to the floor once again during Hurricane Matthew when demand for disaster response communicators outstripped the supply of ARES operators in many states. The academy's Introduction to ARESMAT will describe how the program works to supply operators from outside the affected areas in a system of mutual aid agreements, how to best use ARESMAT resources, and for the individual ARESMAT-deployed operator: what to expect, and how to prepare for deployment. This course will be presented by Colter. For newcomers to HF operation in the context of emergency and disaster response communications, a course entitled HF for Emcomm, will discuss HF antennas and equipment, temporary station setups, and operating in the field, taught by Stohrer. An all new workshop course for students getting started with the NBEMS digital messaging system will be presented by George Blakeslee, N1GB. A special course on WebEOC Training will be restricted to ARES members who are regularly assigned to a municipal EOC, and recommended by their Emergency Coordinators. The course will be taught by a member of the state's HSEM staff. Presentations/courses on Winlink Express and the Winlink 2000 world-wide radio email system and an APRS technical workshop will wind up the academy's curriculum. For more information and registration, contact Dave Colter, WA1ZCN, Assistant SEC for Training, ARRL New Hampshire Section. At the state level in New Hampshire, ARES and RACES are basically the same thing. The state's Homeland Security and Emergency Management (NH HSEM) does not maintain a standing RACES program, and uses NH-ARES to meet its backup communication needs. In the event that circumstances require operation under RACES rules, the plan is to mass-enroll as many NH-ARES operators as are needed and volunteer at that time. The reason for this approach is that under state law, the state must provide Worker's Compensation Insurance coverage for all official volunteers. While this was enacted to cover mountain search and rescue volunteers, it includes all volunteers, regardless of role or agency. NH HSEM has no budget for this at present. RACES -- What is It? RACES, the radio amateur civil emergency service, is expressed in Part 97 of the FCC rules, and is defined as "a radio service using amateur stations for civil defense communications during periods of local, regional or national civil emergencies." RACES is a government program, and ARES is an ARRL program. From an ARRL website ARES/RACES FAQ: "ARES is activated before, during and after an emergency. Generally, ARES handles all emergency messages, including those between government emergency management officials. RACES, on the other hand, almost never starts before an emergency and is active only during the emergency and during the immediate aftermath if government emergency management offices need communications support. RACES is normally shut down shortly after the emergency has cleared." Check out the FAQ for more on the distinction between ARES and RACES, and the importance of maintaining membership, cooperation and coordination in and between these entities. As an ARES operator I frequently set up in the field taking along my trusted to-go box. Most recently it was put to use for the Trump/Clinton debate in Las Vegas, Nevada, and the Vigilant Guard Communications Exercise, in the County Mobile Communications unit. There, the mission was to provide voice and packet relay should the MACC (Multi-Agency Command Center) be unable to make contact with distant stations. After the Vigilant Guard Exercise, the local ARES District EC requested we bring our to-go boxes to an ARES training session as a show-and-tell for newer members to see what was possible. I needed a new one to show, after my box was broken. I headed to the nearest home supply store to see what was available for a replacement. Our ARES members have boxes that range from the higher-priced 19 inch rack models, to tackle boxes and ammo boxes. After checking out the plastic toolboxes as options, some with wheels, some having pull-handles and stackable accessories, I decided to go with the utmost in simple: The bucket! I bought a food grade 5 gallon bucket, along with a screw-on top, purchased separately. 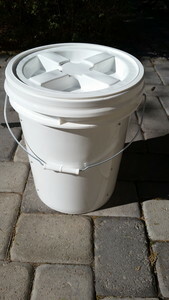 The top is purchased with the screw-on rim that must be pushed onto the top of the bucket where it is held on by friction. Total cost for the three items: $12.00. Inside there are 2 shelves. The top shelf is wood. The bottom is steel. Prior to cutting the wood and metal it was necessary to create cardboard templates. These templates were placed inside the bucket at the same time to check for measurements to ensure the packet radio modem/TNC (Kantronics KPC-3+) would fit in the space on top of the wooden shelf while the radio was hung under it. The metal shelf was sized to allow an on/off switch box to be placed under it while allowing room for the power supply, radio and power distribution box on top. The Powerpole distribution box is placed between the power supply and the radio. The radio and TNC remain plugged into the distribution box. The red and black Powerpole connectors between the radio and power supply were set so that either the power supply or an alternate power source could be easily plugged in. This provides the input to the power pole distribution box. The components are held in place with 1 inch Velcro strips cut to each unit's width. I placed the thin metal shelf under the power supply to mount it using the original screws that hold the feet onto the supply. Measuring and accurate drilling of 4 holes for the mounting screws made it an easy installation. Quarter round wooden stock was used to conform the shelves to the shape of the bucket. Shelves are screwed to the quarter round then inserted into the bucket and secured to the bucket with screws from the outside. I used a flashlight inside the bucket when screwing from the outside to create a shadow, so I didn't miss the quarter round. The bucket will be complete once I add the soundcard interface and weather proof the 6 screws on the outside. The on/off lighted switch box under the power supply is connected between the alternate power source and the powerpole distribution box. I used the lighted switch to indicate power was coming into the switch. This allows me to know when I've lost external power without having to dig my multi-meter out of my toolbox. Also inside the bucket I store a magnetic mount antenna, dual band handheld, and the power cord to connect to an external source. I will be adding the West Mountain NOMIC sound card interface in the bucket to use with an HF system for sound card modes. It will mount on the side between the shelves. The USB cable shown in the photo coming from the top shelf connects to the computer. There is also an adapter cable to connect between the radio and the antenna coax in the box, not shown. 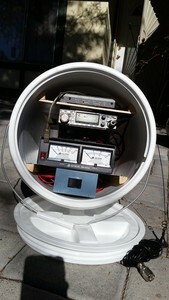 Upon arriving at the ARES training meeting and setting up my bucket packet station at the operating position, it was pointed out that the bucket rim can also serve as a place to hang microphones or handheld radios by their belt clip around the lip of the bucket or on the wire portion of the handle. Parts list: 5 gallon bucket; lid with screw in rim; quarter round stock (enough to be able to cut 2 pieces for each shelf); quarter inch wood screws (enough do to the job, I used 20); shelving material (wood, metal or something else you find that works); water proofing for screws outside the bucket (I'll use sneaker Goop); and, of course, the equipment you wish to use. Readers may wonder: why packet and not a sound card mode for our primary and/or secondary digital mode? Answer: Three years ago, the ARES DEC for Clark County, Nevada, W7HMV, asked me what I thought about packet for local digital message handling. We tried it, and operators liked it. The packet system was so successful a communication plan was created to cut down on the interference caused by/to many stations on the air at the same time during communications exercises. The system was expanded: Through node hopping we can now link from Clark County to Arizona, southern Utah, California, and northern Nevada. We currently only have to use one digipeater for the Nevada-only system, which we hope to replace in the future. (Nodes rather than digipeaters are used to increase throughput speeds). Packet is the digital mode used in the majority of hospitals in the county. The hospital administrations have embraced this system and have their own ham operators. If needed, we can supply ARES operators to supplement them. Is packet slower than other modes? Yes, in some cases. Does it cover areas not covered by faster digital modes? Yes. Is there a learning curve? Yes, however, the mode is fairly easy to learn. Does it provide nearly error free transfer of information? Yes. Why VHF? First, VHF radios are already available with most hams. Secondly, the cost of a TNC is lower than faster modems. Thirdly, the 2-meter band is a universally common disaster response communications band. The county emergency management agency has authorized our packet systems to be co-located at public safety radio sites. The advantages are that these sites have backup emergency power and are in secure locations. The sites are on mountain tops (about 8000') allowing for more line of sight access to systems in the surrounding states. The Sioux City (Nebraska) area is unique--there are three states separated by rivers just across from each other. There are three clubs in the area--two in Iowa and one in South Dakota. Until last year, there has been little activity on the Nebraska side. All that changed when the Emergency Management Director of Dakota County, Nebraska asked that the ARES program be rebuilt to support county emergency communications needs. To fill the request, we needed more radio amateurs, so it was decided to hold a Technician class as soon as possible. Several Emergency Management and Health Department officials and others from as far as 75 miles away registered for the class. Thirty-one students started the classes, including the county sheriff and a local police officer, held in the South Sioux City Law Enforcement Center training room, with logistics support from the Emergency Management Director. The net gain was 19 new Technician licensees with one passing both the Technician and General class exams. Following up on the new hams' needs, an "Elmer Day" showcased a number of stations set up by area hams to give our newbies and others the opportunity to experience everything from kit building to HF to APRS to CW and much more. We will also help them program their new radios, and otherwise get them on the air and into our new ARES program. Over the course of the past year, Dakota County ARES has become vitally active and is receiving assistance in placing three repeaters in the county, with plenty of hams to use them. Most recently, 12 ARES members visited the National Weather Service office in Sioux Falls, South Dakota, to learn NWS policies and procedures, especially concerning SKYWARN, with our severe weather season looming. ARES will take SKYWARN training soon.